Are you in balance? Energy balance that is? Everything we do uses energy. Breathing, sleeping, growing and even thinking uses some energy. Other activities like running, swimming or playing volleyball use a lot more energy. Different activities use different amounts of energy. Energy is just another word for calories. To be healthy, we need to maintain a healthy weight. We do this by balancing the energy we take in from food, with the energy we use being active and growing. 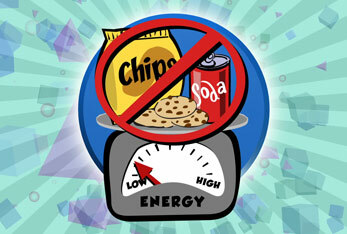 What we eat and drink is Energy In,...What you burn through physical activity and growing is Energy Out. To maintain a healthy weight, we need to balance the amount of energy we take in, in the form of food, with energy we use up by being active. If we eat more than we use, over time we gain weight and get out of balance. How can you keep your energy in balance? Eat healthy meals and snacks, and be active for 60 minutes every day. Below are some additional tips to maintaining a healthy weight. Every day your body uses up lots of energy. Sometimes it needs to be refueled between meals. That's when a healthy snack comes in handy. Some of us think of a snack as a bag of chips, a handful of cookies, or a soda. But these type of snacks, are not nutritious, and don't give our bodies the energy it needs. 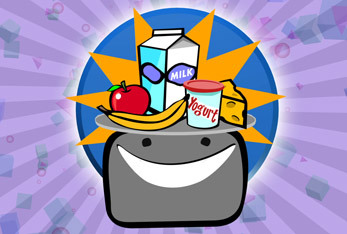 A healthy snack, like fruit, cheese, yogurt, vegetables or milk can give you just the right amount of energy to keep you going.